Glassboro, NJ. May 2010. 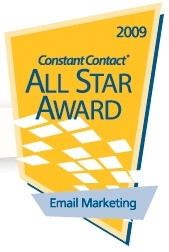 Manna Design Works is very pleased to announce that they have been selected as a winner of a 2009 Constant Contact All Star Award. Manna received the 2009 All-Star Award for demonstrating best practices in the effective use of Constant Contact Email Marketing and Online Surveys in the following areas. The award was made by Constant Contact, a publicly listed company which provides email marketing, event marketing, and online survey tools. Constant Contact has more than 350,000 customers worldwide, with the All Star Award going to less than 15% of those users. “Our customers work hard to build strong relationships with their clients and contacts through e-mail marketing and some, such as Manna Design Works, truly excel in this effort,” said Gail Goodman, CEO, Constant Contact. “We created our All-Star Awards to highlight those customers who are passionately committed to following our best practices as they work to improve their customer communications. We’re proud of the role we play in helping Manna be successful and we look forward to continuing to assist the company with its marketing efforts.” Robert Harrington, Owner of Manna Design Works said of the award … “We are extremely pleased to have won a 2009 Constant Contact All Star Award for not only the work we do for our own marketing efforts, but primarily for what we do for our clients. We work very hard to get our clients the most out of every marketing dollar and managed email marketing is a great way to maximize ROI. Constant Contact is the industry’s leading provider of email marketing and online surveys. To have been selected as a winner of the award from over 350,000 Constant Contact customers is great recognition of our efforts and the quality of our clients’ communications. We’d like to personally thank each and every one of our email marketing and online survey clients for the role they have played in us winning this award.” Manna Design Works is a full-service Creative Marketing Firm specializing in small to medium size clients. Founded in 2003, the company offers Website Design & Redesign, Marketing & eMarketing, and all forms of Print Graphics. Specific services include: Email Marketing, Direct Mail Campaigns, Graphic Design, eCommerce, Search Engine Optimization, (SEO) Google Pay-Per-Click Campaigns, and Same Day Service on website updates. Manna was recently named among the Top 10 of Web Design Agencies in the South Jersey/Philadelphia Metro area. To learn more, please visit www.MannaDesignWorks.com or call 856-881-7650. With more than 350,000 customers, Constant Contact, Inc. is a leading provider of email marketing, event marketing, and online surveys for small businesses, nonprofits, and member associations. Founded in 1995, Constant Contact helps small organizations grow stronger customer relationships by delivering professional, low cost, easy-to-use online tools backed with award-winning support, education and personal coaching. Constant Contact is a publicly traded company (Nasdaq: CTCT) with offices located in Waltham, Mass. ; Loveland, Colo.; and Delray, Fla. To learn more, please visit www.ConstantContact.com or call 781-472-8100.